This assemblage of studies from international researchers inplanar, or thin layer, chromatography describes the many advancesthat have placed the technique so much in the vanguard of materialsanalysis research. Chapters describe currents in planarchromatography; use of bonded phases in planar chromatography;immunostaining in TLC; TLC in pharmaceutical research;determination of ascorbic acid by TLC-densitometry; isotopescanning in TLC; and more. This addition to the outstanding WileySeries in Chemical Analysis is a reference staple for analyticalchemists in academia and industry as well as scientists in relatedfields and students of chemistry and the life sciences. 1990(0-471-50109-3) 199 pp. 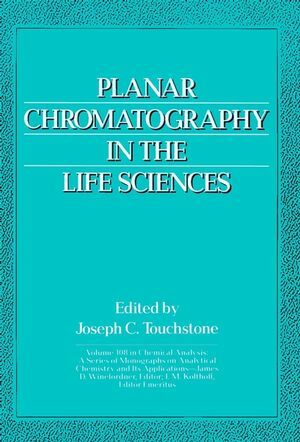 Joseph C. Touchstone is the editor of Planar Chromatography in the Life Sciences , published by Wiley. Currents in Planar Chromatography (J. Touchstone). Rapid Detection and Quantitation of Lipids on Thin-LayerChromatography by Nile Red Fluorescene (S. Fowler). Use of Bonded Phases in Planar Chromatography (M. Gould & T.Enzweiler). Analysis of Butyric Acid in a Model System (E. Heilweil, etal.). TLC-Immunostaining of Glycolipids (M. Saito & R. Yu). TLC in Pharmaceutical Research (N. Grinberg, et al.). Enantiomeric Separation by Thin-Layer Chromatography (S. Han &D. Armstrong). Assay of Biphenyl Metabolities by HPTLC-Spectrodensitometry (S.Levin, et al.). In Situ Determination of Malondi-Aldehyde on Thin-Layer Plates byFluorescence Spectrodensitometry (J. Alvarez, et al.). Analysis of Ascorbic Acid by Thin-Layer Chromatography (J.Touchstone, et al.). One- and Two-Dimensional Scanning for ?32P and Other Uncommon Tags(E. Rapkin). Bioanalytical Application of Thin-Layer Chromatography/FourierTransform Infrared Spectrometry (J. Herman & K. Shafer). Detection of Radioactivity Distribution with Position-SensitiveDetectors, Linear Analyzes, and Digital Autoradiograph (H.Filthuth). New Techniques in Two-Dimensional Data Processing (D.Sequera).